I do not think any summer drink is more refreshing than lemonade, and although I do enjoy it myself, I prefer to make my own at home so I can avoid store bought ones that are sweetened with a boat load of refined sugar or artificial sweeteners. I was making lemonade one day this summer and realized that I had one very ripe watermelon that needed to be eaten quickly or it might spoil. I decided to combine the watermelon flesh with my lemonade and pureed it until it was smooth. I prefer natural sweeteners, so I added some liquid honey just to tame the lemon just a bit, and then served it in glasses mixed with sparkling water. The drink turned out so well that I made it often throughout the summer and thoroughly enjoyed the combination of watermelon and lemon. I prefer my lemonade pretty tart, so you may want to add more honey than I do. Just play around with the quantities until you end of with your personal preference. Honey, a natural sweetener is used rather than refined sugar or artificial sweeteners. 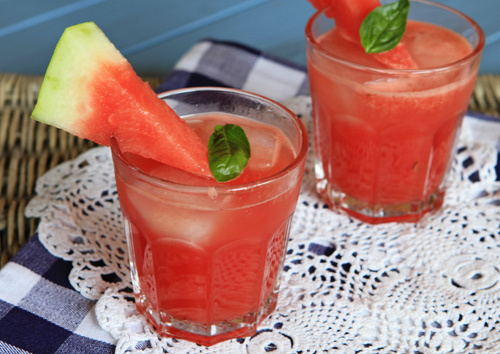 Watermelon adds a twist to traditional lemonade in this refreshing recipe. Place the watermelon and lemon juice in a blender and pulse until smooth. Add just enough honey to create the flavor you prefer. Fill glasses half way with crushed ice, then add half sparkling water and half lemonade mixture.